The weather is definitely cooling down around here, but that doesn’t mean I am done with wanting frozen treats. Sometimes cool and creamy is just what you need despite the season. It’s true life, that’s all. It’s been sad times since my ice cream maker broke in the great move to the midwest, but for this dessert you don’t even need that old machine. Just some mad whisking skills (use a mixer or hand blender, unless you just have guns of steel), a bit of folding, and some freezer time. 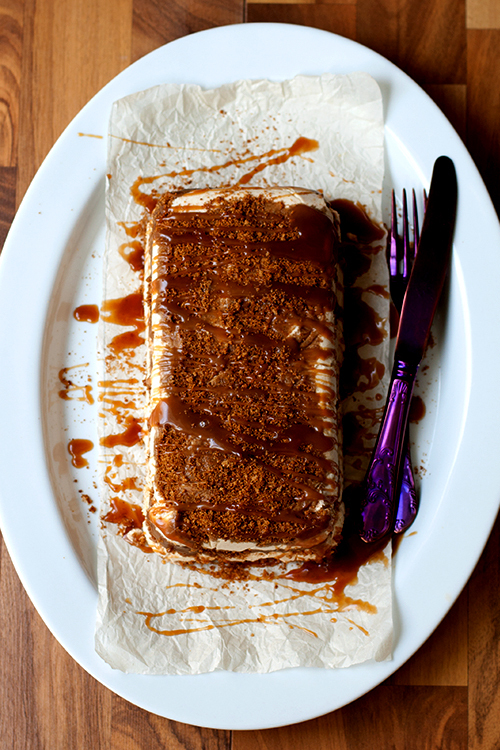 This semifreddo is made up of pumpkin, egg yolks, whipped cream, gingersnap crumbs, and salted caramel sauce. There’s not one thing in it that I don’t love. Using a whisk and those guns of steel, or an electric mixer, beat cream in a bowl until it holds soft peaks. Refrigerate. Stir together pumpkin and spices in a small bowl, set aside. In a small sauce pan mix together honey, molasses, sugar, and water. Bring syrup to a boil over medium heat until a candy thermometer reads 238F. Add ⅓ of the cold, whipped cream to the egg yolk mixture to lighten. 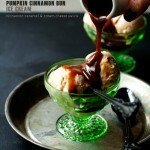 Fold in pumpkin and spices, plus remaining whipped cream. 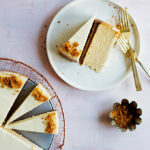 Sprinkle the bottom of a prepared loaf pan with gingersnap crumbs (line with plastic wrap if you want to turn it out, if simply scooping you can skip that step), scrape half of the semifreddo base into the pan, and smooth the top. Sprinkle with more cookie crumbs and drizzle in about ¼ cup salted caramel sauce, top with remaining semifreddo base and smooth, sprinkle with more crumbs. Cover the top of the semifreddo with plastic and then a layer of foil and place in freezer for at least 3 hours to set. Scoop or turn out and slice. Serve cold. In a measuring cup measure out cream and add vanilla, set aside. In a heavy bottomed saucepan heat sugar and water over medium-high until sugar is melted and turns dark golden brown in color (the darkest you can get it before burning is best). Remove from heat and quickly whisk in butter and half of cream until combined and smooth. The mixture will steam and bubble furiously, use a oven mitt or towel to wrap your stirring hand. If there are still lumps, heat gently until smooth. Add remaining cream and salt and stir until smooth. WHOA. This look so good. I love every bit of this. Frozen goodness in the fall is recommended. For realz. You should make this for sure! It’s so much pumpkin goodness! WOW that looks good. 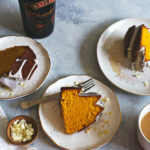 Most unique pumpkin recipe I’ve seen! YUM! This looks soo good! The biscuit base looks quite soft – is it or does it stay crunchy? Natasha, thanks! Some of the biscuit crumbs soften, while others maintain their crunch. 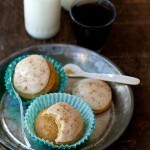 i love pumpkin, so when i tell you that this looks like the best pumpkin dessert i’ve seen, that means a LOT. aw, thanks Katie! pumpkin is where it’s at! This looks so great! Pumpkin semifreddo sounds like such an amazing dessert. And that purple silverware is so cool! Thanks! The purple flatware is from Anthropologie (on sale)! Holy moly that looks insanely good! What’s nice about frozen treats in fall/winter is that you end up experimenting with different flavors/spices for a whole new experience. This looks sooo good and gorgeous photos, as always! beautiful dessert that is perfect for the season! This looks and sounds amazing! What a wonderful flavor this must have. I never think of frozen desserts past summer, but it looks like I’m missing out! Megan, frozen treats are good all the time ;) Thanks! 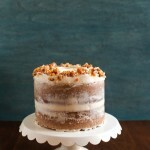 Carolyn, this would be a perfect make-ahead Thanksgiving dessert…I like the way you think! There are no words. Everything I have ever wanted in a dessert! Thanks Terris! I agree, crunchy, creamy, spiced, and a little salty…yum! Amazing Ashlee! I hope you loved the semifreddo! Happy Thanksgiving! Wow, really nice idea! I’m wondering if i can incorporate a layer of chocolate mousse as well? Or you think that won’t combine well with the pumpkin? 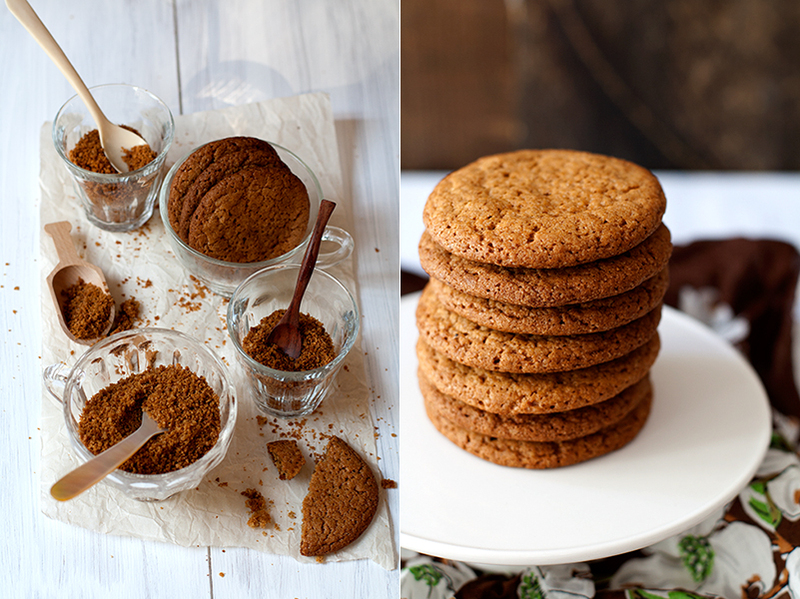 For the sake of time, if I wanted to use store-bought/premade ginger snaps, is there a particular brand you recommend? I’m a huge fan of those super thin and snappy ginger cookies labeled as “Morovian”, usually found in the international aisle…but really, whatever you like! something crisp and crunchy over something soft and/or chewy, though. Hi! 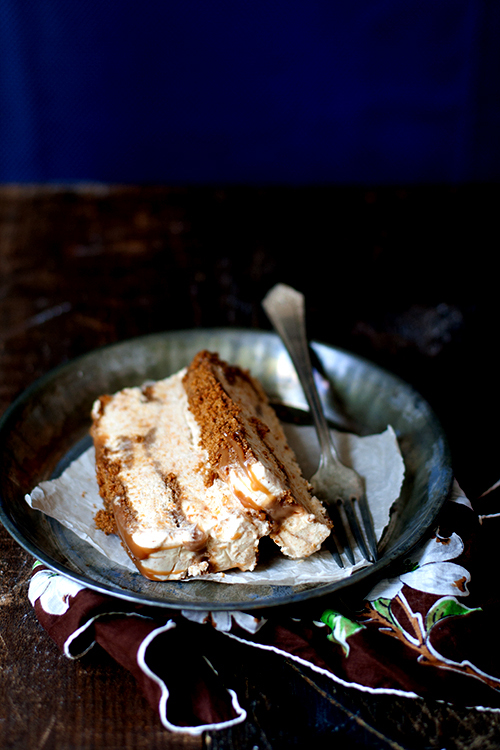 Your semifreddo recipe was nominated as one of the “Best 300 Semifreddo Recipes on the Net”. 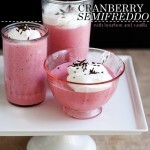 To vote for it, please visit http://easyitalianrecipes.org/dessert-recipes/best-300-italian-semifreddo-recipes-on-the-net-vote-for-your-favorite/ – your recipe is positioned at #18 (random order). is there way to mail this all the way to Dallas? It looks fantastic!